“Always on” where you promote every piece of content that you post. Promote only strategically important posts such as those featuring the latest campaign or those that have a “sign-up”, “buy” or similar call to action. Promote only those posts that get the greatest organic results such as high reach and engagement. Which of these strategies you should choose all depends on the circumstances within your company and your budget allocation. If you’re just starting out with social advertising and want to get a larger budget approved by the management, a good way to test the waters is to start slowly and build up gradually. Starting small allows you to test things and showcase the potential while minimising the risk of financial loss on inefficient posting strategies. If you’re looking to start with Facebook advertising by only promoting your best performing posts, Locowise has a new feature that will help you. “Facebook Post Notification” will notify you when there is a new post that does well organically that you should promote. You may be thinking, why should I only promote posts that work well? . The two main reasons are that it helps you save money and it helps you get more bang for your marketing buck. You only pick to promote those posts that you have seen get the best organic reach and engagement. This means that those posts resonate with your audience and should also get higher engagement when they reach a wider audience thanks to the ads campaign. Engagement is key because in general posts with a higher engagement cost less per click in Facebook ads than posts with low engagement. This will be a substantial money saver for your campaigns. Average Post Reach: Number of people who have seen any content associated with your page. It’s calculated as the sum of organic and viral reach divided by the number of posts published in the last 30 days. 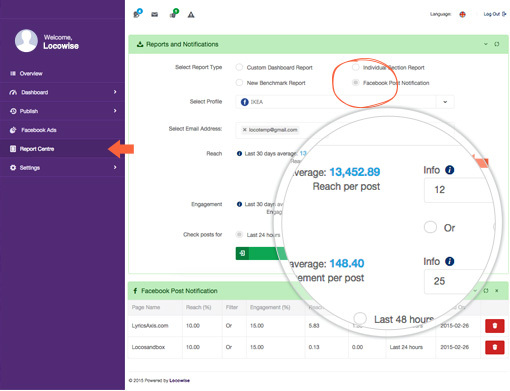 In “Facebook Post Notification” setup process, Locowise allows you to choose which of these metrics (or both) you’d like to consider when choosing which posts to promote. 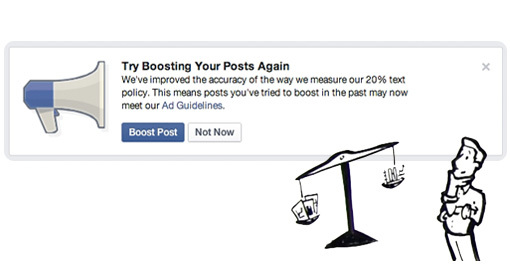 You will then be notified when a post performs better than the average post on your page. To prioritise which posts to promote you can select how well the post needs to do before you get notified: 20% better than the average? 50% better than average? Even more? You decide. Click on “Report Centre” in the left-hand sidebar. Tick “Facebook Post Notification” under “Report Centre”. Select your email address or addresses. Select in which cases you would like to be notified: when a post is doing well in terms of reach and/or engagement and how well the post needs to be doing. Select either to check posts for the last 24 or 48 hours. This is just for the initial check when you set the notification for the first time. From this moment the posts will be checked live as you post them. To finish click “Generate Report”. Your report will now be listed in the “Report Centre” under “Facebook Post Notification”. You will get an email notification when one of your posts is doing well and is ready to be promoted. Keep an eye on your inbox for emails from Locowise titled “Your post is ready for boosting” and start promoting.